Gauri Lankesh, a senior Kannada journalist known for her criticism of Hindu extremism, was shot dead at her home on Tuesday evening. According to police, at least three suspects were involved and Lankesh was found dead on her verandah around 8pm with bullet wounds to her head and chest. Lankesh, 55, was the daughter of famous poet-turned-journalist P Lankesh. She was the editor of Gauri Lankesh Patrike, writing often against Sangh organisations and communal violence in the country. she is a over ground naxal supporter. Addressing separate news conferences, they lashed out at each other to "protect the 25-year-old publication's ideology." While Gauri claimed her social activism was not accepted by her brother, Indrajit countered saying his sister's pro-Naxal stand was coming in the way of the paper's ideology. She tried leaching money from some local BJP politicans in the style of some other investigative journalists. They put a defamation case and she was convicted by courts. He brother is saying she was getting ready to expose corruption by current govt held by Congress. Last edited by sarv_shaktimaan; September 6th, 2017 at 08:53 AM. Can't believe she was buried with full state honours. Wonder what is the criterion for such privilege. Anyway, RIP. 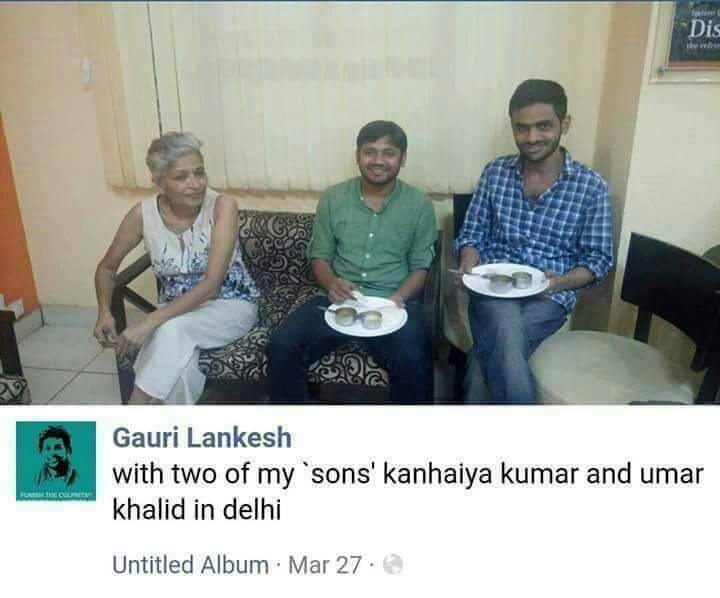 She considered chutiya Kanhaiya her son. Reveals how deep, widespread the commie network is and how congis have nourished it. If nothing else at least this is clear now. Her own brother is asking for CBI enquiry as he doesn't not have confidence in state govt. Both of them were also not on good terms. So there is a lot of Kaala in daal. But MSM has already pronounced central govt guilty and are preparing for another Andolan. Politics to blame RSS and get vites in upcoming Vidhan sabha elections. Sadly, MSM has had to admit their narrative was inaccurate. If you tweet, only then bastards know you. Keral mein ho rahe Hindu atyaachaar pe, 'promote' maar ke,... Hindu o' ko bas khatm karne par hi tuli huyi Shoorpankhaa thii,....... Toh, Christian ke naate dafnaayi gayi,... ! Brother says Gauri Lankesh was getting threats from Naxals: Indrajit Lankesh, brother of journalist Gauri Lankesh who was shot dead outside her house in Bengaluru on Tuesday, has said that she was getting threat letters from Naxalites. Indrajit told several TV news channels that Gauri was successful in brining some Naxalites to mainstream and that's why she was getting threats from the left wing extremists. However, Indrajit said that Gauri never informed the family about any specific threats. Jab Keral mein Hindu mar rahe the,... tab uuse swachh Bharat Abhiyaan huyela lagta thaa,.. ! Did not court also had punished her ? Few says, राष्ट्रपति राम है, रक्षामंत्री सीता है, संसद में सुमित्रा है, संघ में मोहन है, ....... तोह, लंकेश का वध तोह होना ही था !! केरल मे स्वंय सेवको की हत्या पर कहने वाली की - "स्वच्छ केरलम्"
अब हम कहते हैं- स्वच्छ कर्नाटकम्. Last edited by log1iszero; September 8th, 2017 at 10:32 AM. How CCTV camera saw Lankesh’s murder ? Last edited by log1iszero; September 9th, 2017 at 11:39 AM. Patrick? the word I have read is Patrike. Patrike is like the newspaper she was editing. patrike is kannada for patrika, which in Hindi means magazine .. I wonder if people don't understand that or deliberately muddy waters. There is an international movement growing about why Modi won't unfollow the folks who rejoiced Gauri Lankesh's murder, and they are linking it with Donald Trump and his followers on Twitter. Prollem is chootiyatic media thinks Twitter is the world, and anybody not on twitter has no right to vote or speak. Lazy journalism. We are partly to blame I reckon. Media goes behind TRPs - he who shouts loudest gets more attention - whether that shouting has any substance or not. There is no fact checking and not a lot of media outlets have the convictions.